Derby fans, this is what it all comes down to. 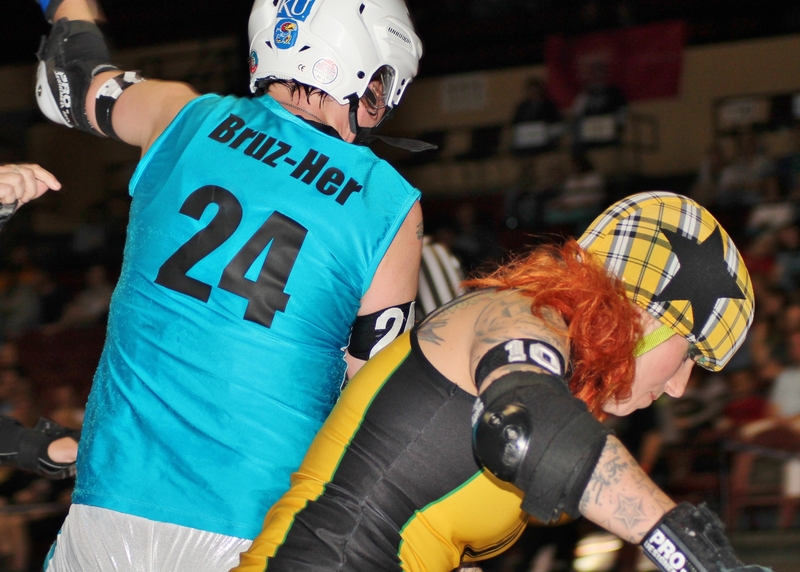 The Kansas City Roller Warriors have rocked Municipal Auditorium all season long, and this Saturday night, the Rink of Fire championship will settle for good and all who holds flat track supremacy in 2013. The evening begins with the third place game between the Dreadnought Dorothys and the 2012 champion Victory Vixens. The Dorothys have had a rough go of it the last couple of seasons, going winless in both ’12 and ’13 after six straight seasons of taking home the house cup. These two teams faced off last month in what amounted to a preview of this year’s Rink of Fire, and while the Vixens claimed a solid 206-111 win over the Ruby Reds, we couldn’t help but notice how long it’s been since anyone scored 100+ points against the Red White ‘n Blue… who, if you’ll remember, didn’t lose one stinkin’ game in 2012. Granted, a handful of Vixens retired after the ’12 season, and the great Situation, née Evolution, is now skating her heart out in the Hawaiian isles after retiring from the Roller Warriors after last month’s game. So there are factors, to say the least. Nonetheless, we’re predicting a Vixens win by 70 points or better, but expect the Dorothys to show up in full force, never giving an inch and taking every mile they can get their hands on. Then, in game two… you shall bear witness to what may well be the most important bout in all of Kansas City roller derby for the 2013 season. The Knockouts and the Black Eye Susans, neither of whom have ever taken home a Rink of Fire championship in the nine-year history of the Kansas City Roller Warriors, will take the track in what is absolutely guaranteed to be the most intense championship bout this phenomenal league has ever brought us. Last month’s game between these two titans saw the Knockouts‘ 53-point halftime lead dwindle to six late in the fourth period. The whole ball game was decided in the final jam when the Black Eye Susans jammer was sent to the box on an unfortunate (and perhaps controversial) penalty that allowed the Knockouts a power jam and resulted in a 164-146 final. Eighteen points, people. That is nothing in WFTDA flat track. To further muddy the waters, the Susans were skating without mainstays Damsel of D’Tension and Extremely Frank last month as well, both of whom will be back and ready to roll this Saturday night. In other words, last month’s game told us absolutely nothing, and this next one is almost impossible to call. Having said that, we’re predicting a Knockouts win by a margin of THE VERY LAST JAM. These two teams are so well-matched, the whole thing is going to wind up being a white-knuckled nailbiter pretty much from start to finish. There really is no sufficient hyperbole here. Doors open at Municipal Auditorium at 5:00 Saturday evening, and the first whistle is promptly at 6:00. Get there early. This, above all others, is the bout night you do not want to miss. 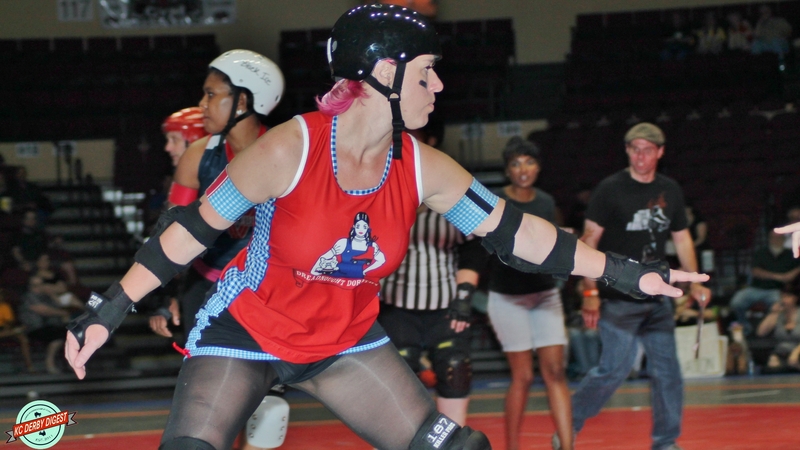 These Roller Warriors have been through a lot in 2013; all four teams have made significant strides on the track this season, and the Rink of Fire is what it all comes down to. Show your support for this league of extraordinary women and cheer your favorite team(s) on to victory this Saturday night! We will definitely, definitely see you there!